Tips to Outclass Your Competition – The #1 pitfall in negotiating. The Coach’s Corner – What is success for you? Quotes of the Month – Never fear to negotiate. Ask the Expert – How can I hold my boundaries? Everyone negotiates. You negotiate with your spouse about where to go for dinner, with your boss about salary, and with your kids about what movie to see. 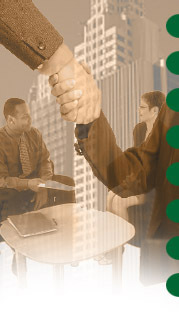 The ability to negotiate successfully is crucial for survival. Negotiation is not another word for fighting. It is a process by which you exchange information to find ways to satisfy the interests of both parties. Voicing your opinion is not being a bad guy and very often winds up being a reality check to better solutions. Don’t be afraid to negotiate. Everything is negotiable. Follow these steps for successful negotiations. Be a good listener. Pay careful attention and occasionally ask “Do I understand correctly that…” Ask probing, respectful, questions and then zip up. Just listen, pause, think! Be prepared by having as much information as possible. What do they need? What do you need? What are the options? Steve Cohen cites a negotiation story about two sisters fighting over an orange. Both adamantly wanted the orange. However, when a parent separates the two and asks why they want the orange, one sister says she wants to make juice and the other wants to use the rind for cooking. Both got exactly what they wanted, but only after asking the right questions. Don’t judge, and don’t assume anything – collaborate, cooperate, have an open mind – and yes, ask questions. Be a detective – clarify, confirm, take notes. And the #1 pitfall in negotiating – loosing control of your emotions. If you lose your cool, the other side gains the edge. Keep your emotions in check. Count, breath deeply a few times, ask for clarification, call for a break – do whatever you need to do regain your composure. Negotiation is a life skill. It is a person-to-person activity. You are not dealing with a bank or a car dealership – you are dealing with people. Don’t neglect the “people factor.” Work toward a win-win result. How do you score on the customer service quiz? How well do you or your employees handle complaints? To impress your customers, keep their business, and increase your profits, click here or call 405-341-3216 today. How do you define success for yourself? Most likely, others, your culture, the past, hope or advertising, define it. Only you can truly define success for yourself. Stick with this wording because this sets you up to articulate more clearly how you not only define success, but how you know you’re being successful at any given moment. It may take you months to come up with these. Try them on, change them, and tweak them. Once you come up with your 3 definitions of success, see how closely your life is aligned with your definitions. What is pulling you toward them? What is moving you away from them? As your coach, this is just one of the exercises we do. This helps us hone in on what is important for you at this moment. What changes do you need to make for you to live your definitions of success? If you discover something from this exercise, I’d love to hear from you. I promise not to use your story without permission and would never use your name. Ask the Expert - How can I hold my boundaries?